Four candidates for public office and a representative for gubernatorial candidate Eliot Cutler attended a forum on the east-west corridor Oct. 23 at the Center Theatre in Dover-Foxcroft. Pictured, from left, are Democratic gubernatorial candidate Mike Michaud, Maine Senate District 4 Republican candidate Paul Davis, State Senate District 4 Democratic candidate David Ziemer, Ted OMeara from Cutlers staff and House District 120 Republican candidate Norman Higgins. DOVER-FOXCROFT, Maine – Democrats and Republicans disagree on many points going into the home stretch of the 2014 campaign, but five participants at a Dover-Foxcroft forum on Thursday said they’re united on one issue. They don’t like the concept of an east-west highway or utility corridor and won’t support any legislation that threatens private property rights. Democratic gubernatorial candidate Mike Michaud; Republican Paul Davis and Democrat David Ziemer, who are vying for Senate District 4; Norman Higgins, the Republican candidate for House District 120; and Ted O’Meara from Eliot Cutler’s staff attended the forum at Center Theatre, which drew approximately 80 people. Others who responded in writing expressed similar opinions. Organizers asked all candidates to respond to six questions related to the proposed limited-access highway from Calais to Coburn Gore being promoted by Cianbro CEO Peter Vigue. Many opponents say they’re concerned that the highway’s route could also include oil or natural gas pipelines and other utilities. 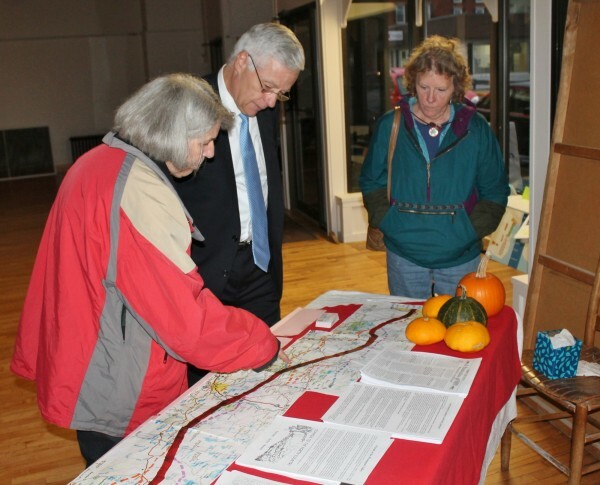 The questionnaire asked if candidates felt the corridor would be “beneficial or detrimental” to the region; how it would be taxed, if built; what “mitigation of equivalent value” would they endorse; what measures would they support to ensure residents get “maximum benefits”; if they would assure that residents along the route “have a say in its location and impact” and their opinion on federal laws that could benefit the proposed corridor. Gov. Paul LePage, Cutler, U.S. Senators Susan Collins and Angus King, 1st District Congresswoman Chellie Pingree and 2nd Congressional District Democratic candidate Emily Cain answered the questions in writing. Second District Republican candidate Bruce Poliquin and 1st Congressional District GOP hopeful Isaac Misuik didn’t respond; and 2nd Congressional District independent candidate Blaine Richardson had planned to attend the forum but canceled at the last moment. The Democratic candidate also said the area needs to maximum its value to farmers and foresters. “There are many working farms in the region and we need more of them,” he said.